Have you ever had to find bilingual candidates or search for people who speak a specific language? If so, you’re in luck – this week’s post focuses on a few ways of how do just that. If not, no worries – the thought processes and search strategies I use in this post are helpful no matter what it is you’re searching for, because searching is 95% critical thinking and 5% Boolean syntax. As with all searches, you must first realize that not all people who can speak more than one language will actually make mention of that in their resume, their LinkedIn/Google+/Facebook/Twitter profile or updates, or anywhere else they may leave information about themselves online. I’ll show you at least 1 way of searching for people who are highly likely to be bilingual, but do not make any explicit mention of languages or polyglotism later. However, while this will yield some people who are bilingual in Spanish, it will also yield false positives in many cases – pulling up people who took courses in high school or college, and people who make mention of Spanish because they have basic speaking or reading/writing skills. In most cases, employers looking for bilingual people are looking for people who are fully fluent. Before I get to any more examples, I have to let you know I always hesitate to provide sample search strings because Booelan searches should be bespoke – specifically tailored to meet the precise information need. And you must realize there is never a perfect/ultimate Boolean search string to find anything – all searches “work” provided they are syntactically correct, and practically any search can (and should!) be iteratively improved upon through successive searches for ever-improving relevance and results. Also, although some people have a hard time wrapping their heads around this fact, every search you run both includes some people with what you’re looking for and excludes some people who have what you’re looking for, so no single search can possibly find all potential matches. Now that you’ve read and accepted my Boolean search dislaimer, let’s take a look at a few more search string examples. If you had access to Monster, you could leverage fixed proximity search to force the mentions of “Spanish” and Native OR fluent OR bilingual OR “bi-lingual” to be within 10 words of each other, increasing the likelihood that they are mentioned in the same sentence, which has extremely high semantic value. As you can see in the above example, however, Bing’s proximity works bidirectionally (forwards and backwards), so you may find people who mention that they are bilingual/native with another language other than your target language, and something less than native/bilingual proficiency with your target proficiency. Granted, the person above claims to be fluent in Spanish and native in Portuguese, but you can see how Google “skipped” across the words “fluent” and “Portuguese” to connect “Spanish” with “native.” Because Google’s asterisk modifier is imprecise, it can and will at times yield imprecise search results. Here is a basic example of a Google search for resumes of people who mention being bilingual in Spanish and also mention Java. Of course, you can also experiment with the number of asterisks you put between “bilingual” and the language you’re searching for. And for all of the above searches, you can and should mix and match a variety of terms that can be used to describe a high level of language proficiency (bilingual, bi-lingual, native, fluent, etc. ), as well as any/all of the ways a person might refer to a language (e.g., Chinese, Mandarin, Cantonese). LinkedIn has built-in language search in their advanced search interface which ties into the languages section on LinkedIn profiles. 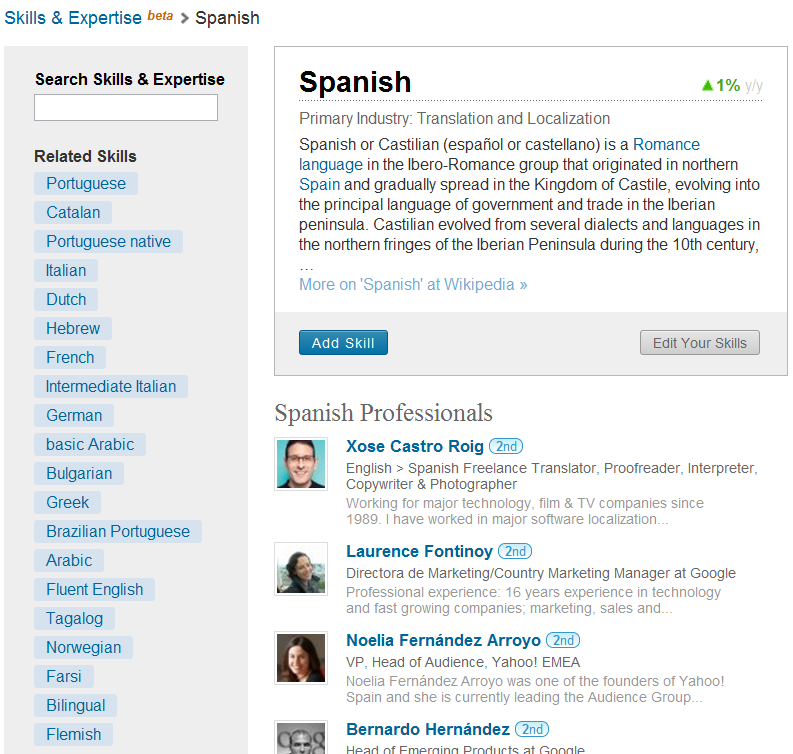 One of the limitations of using LinkedIn’s language search functionality is that not everyone will actually use the languages section on their profile – a person needs to consciously make the effort to add the languages section to their profile and then choose their proficiency. Which leads me to the next limitation. As you can see above, you can search for a language, but you can’t search by proficiency level. I love the fact that LinkedIn included languages to profiles, but they left many unanswered questions. For example – what’s the real difference between “Full professional proficiency” and “Native or bilingual?” Would someone choose “Professional working proficiency” if they were fluent? What level of fluency could that represent? It would also be nice if you could search by fluency level, but even if you could, there would have to be some kind of definition/description of what each level is supposed to represent so people could intelligently and accurately select their own proficiency, as well as enable others to more accurately search by proficiency level. When I searched for Java developers and selected “German” in the language facet, the top result was of someone who only had “limited working proficiency.” Not too helpful if I needed someone who was fluent. 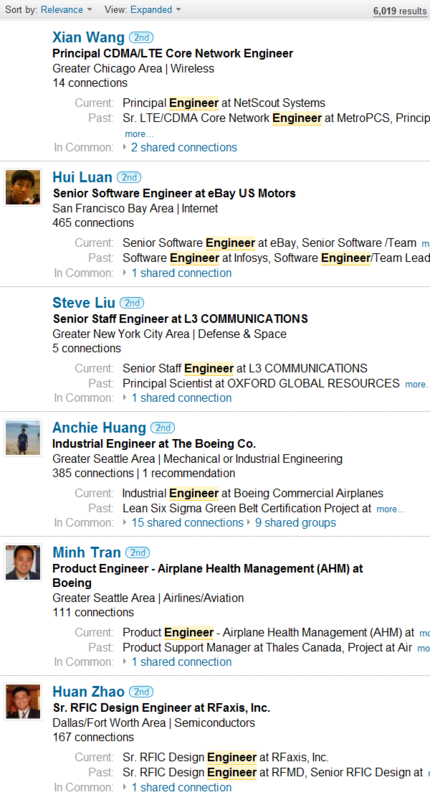 As I showed above with my example Google X-Ray search of LinkedIn, some people enter languages in their Skills section. So how do you go about finding people who may be bilingual but don’t mention any languages on their resume/profile? One way is through implicit search, which is the 3rd level of Talent Mining. Do you think they might be bilingual in English and Chinese? You’ll also notice there is no mention of any language, nor of being bilingual. Taking this approach one step further, you should ensure that your searches are mutually exclusive of explicit bilinguals. To do so, simply NOT out the obvious search terms. Click here to see the search results – there are 5,218, which isn’t much less than the 6,019 from the first search above. That shows that this technique definitely uncovers a solid amount of people who have a high probability of being bilingual in my target language who do not make any explicit mention of a language or polyglotism. Now, the keywords I used in the example are FAR from exhaustive or complete – you could easily build it out to include most of the major universities in China, as well as all of the provinces and major cities. 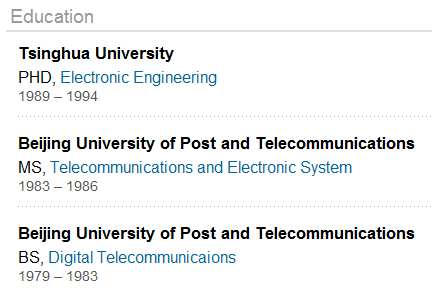 The first result in my search already gave me a new term to add to my search – Tsinghua. This same implicit search approach could be used for any language. However, please note that this is something that you can do after you’ve already searched for and found all of the people you can from the direct searching methods that you would typically perform first, including the ones I detailed in this post. While this kind of implicit search can certainly yield false positive results, it taps into Dark Matter profiles (and resumes!) and is guaranteed to find you people who are bilingual that you CANNOT find through any direct search methodology. Have Some Great Bilingual Search Techniques? Now that I’ve given you a few ways you can try to find people who are likely to be bilingual, what are your favorite techniques for identifying bilingual candidates? Take this chance to share with the international sourcing and recruiting community! 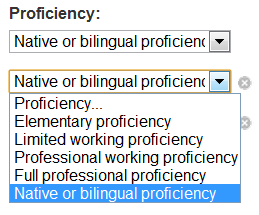 Of course, when searching for bilingual professionals, it helps if they spell the language correctly.